Posted on Sat, Jan 14, 2012 : 7:25 p.m.
A player stretches before a high school game played recently at Progressive Field in Cleveland, site of Sunday's Frozen Diamond Faceoff game between Michigan and Ohio State. The Michigan hockey team had an hour-long practice on the outdoor rink at Progressive Field in Cleveland on the eve of its Frozen Diamond Faceoff game against Ohio State. MGoBlue Video captured the Wolverines arriving at the Major League Baseball stadium and spoke to coach Red Berenson and several players about the venue. 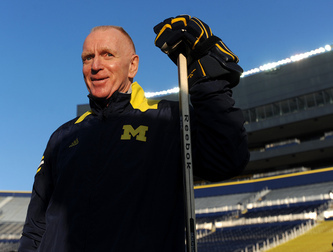 Michigan coach Red Berenson is shown above prior to last year's Big Chill at the Big House in Ann Arbor. His Wolverines take on Ohio State in the Frozen Diamond Faceoff at Progressive Field in Cleveland on Sunday. In fact, there is a winter carnival going on around the ice rink. This is the second year the Cleveland Indians have sponsored Snow Days, a month-long outdoor festival. It includes "The Batterhorn" tubing hill that starts behind the stadium's left-field wall and runs more than 200 feet to where second base would be located and an ice skating path that loops around the ballpark. While the setting is different, the outdoor game experience is nothing new for many members of the Wolverines' roster. They've played in outdoor games each of the past two seasons -- the Camp Randall Classic in Madison, Wis., in February 2010, and the Big Chill at the Big House at Michigan Stadium in December 2010. Still, there's an aura surrounding any outdoor game, particularly one played in front of a large crowd. Attendance estimates for Sunday's 5:05 p.m. faceoff on Fox Sports Plus (Comcast channel 901 in Ann Arbor) have ranged between 25,000 and 40,000. Ohio State isn’t as familiar with the outdoor game. None of the current Buckeyes were on the roster when Ohio State played Wisconsin at Lambeau Field in Green Bay, Wis., in February 2006. That’s why OSU coach Mark Osiecki - an assistant at Wisconsin when Michigan played at Camp Randall Stadium - was glad his team visited Cleveland last week to get a taste of what to expect Sunday. Wind is just one thing, he told the Cleveland Plain Dealer. "The wind was coming right out of right field,” he told the newspaper. “You had to lean into it, and then you turned around and coming back you almost didn't have to skate, it just blew you down the ice." No. 15-ranked Michigan (13-8-4, 7-6-4-1 CCHA) enters the game fresh off a 4-0 win over the No. 2 Buckeyes (14-5-3, 10-4-3-1) Friday at Value City Arena in Columbus, Ohio. Hunwick made a career-high 46 saves for the Wolverines, recording his third shutout of the season and eighth of his career. His last shutout, a 1-0 overtime win at Alaska on Dec. 3, started Michigan’s current string of eight games without a loss (6-0-2).